Pouring out his love with roses and a gold locket necklace, this little guy is trying to gain favor with his sweetheart on Valentine's Day or any day! 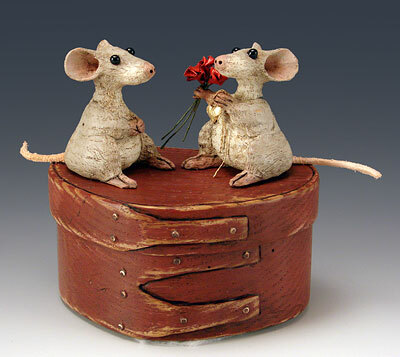 The mice and heart shaped shaker box are carved from American chestnut, the shaker box is carved from a solid piece of chestnut and is not functional, the lid can't be removed. The roses and locket are made from copper wire and mesh by the artist with very delicate detail. This one is perfect for love at any age!